High-definition, cone-isolation contrast testing provides a detailed assessment (with a numeric score) of each cone-cell population. The contrast “Threshold” scores as well as associated “Standard Error” are useful to quantify performance as well as for assessing changes over time from acquired deficiencies that have been otherwise clinically missed entirely.Testing for acquired color vision deficiencies (which may be caused by retinal and optic nerve trauma or disorders, cataracts and use of high risk medications) may be one of the most underutilized measures of functional vision. 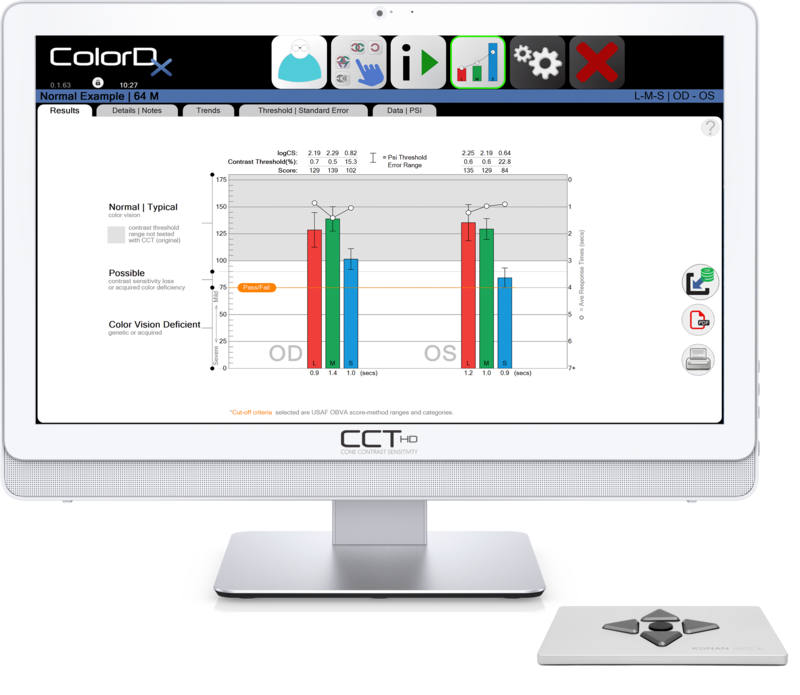 Commonly used color vision tests (such as printed pseudo-isochromatic “Ishihara plates” designed a century ago), may only test genetic deficiencies and completely miss acquired deficiencies as well as being non-quantitative.ColorDX CCT is the state-of-the-art system to assess color vision deficiencies in high-definition and is one more tool enabling the doctors at Lentz Eye Care & Associates to diagnose and treat eye diseases at a much earlier stage.